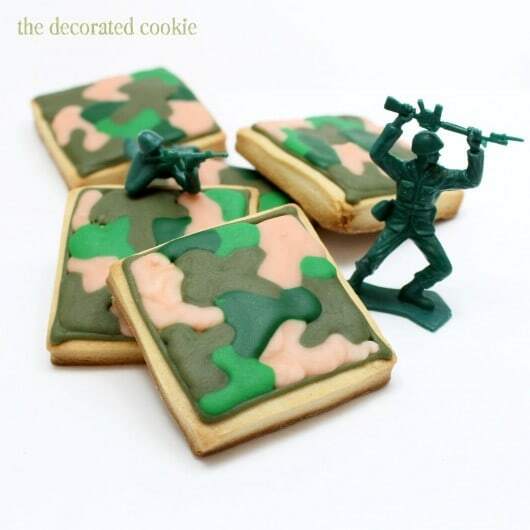 How to make and decorate army cookies (camouflage cookies). Good morning everybody! I’m taking a break from sweet things and shifting focus for just a bit. Today I’m donating to the Wounded Warrior Project, and I urge all of you to visit this site as well. 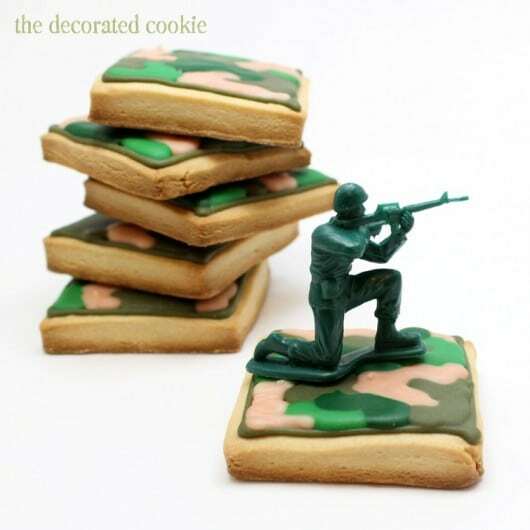 In the meantime, here are some army cookies (which would go nicely with some flag cookies). 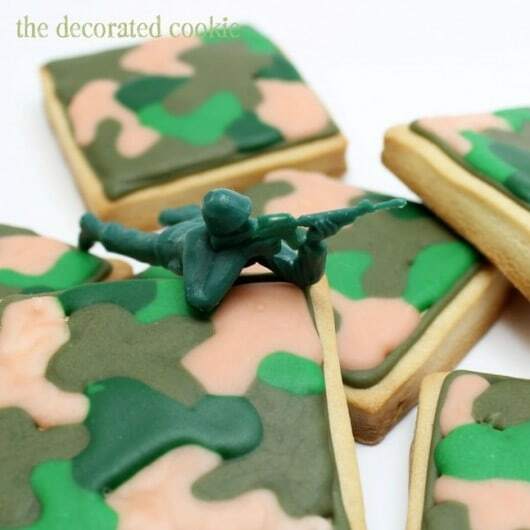 These camo cookies would also make appropriate Veteran’s Day or Memorial Day cookies. 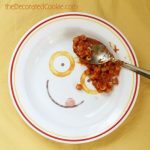 I tend to keep my blogging world and my home life so separate–except when I’m checking email with my four-year old pulling on my arm–that it seems contrary to this community we share, you and me. Cuz you and me, we’re here together. I’m pretty sure the reason for this divide between my bloglife and real life me is because my largest story is undoubtedly my twenty-year battle with severe illness. It feels so off-putting to share talk of disease with talk of cookies and marshmallows. Surely, you don’t want to hear about intestines and morphine when you visit me for icing. I spoke a little bit about my struggles with IVF HERE, and in that post I refer to THIS article in the Journal of General Internal Medicine that I wrote several years ago that gives a snapshot of my experience with illness, hospital stays, surgeries, death scares and ICU. 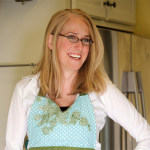 But through all of these health struggles, I’ve squeezed a life in there, too. Grad school, cookie decorating, shooting pool. I met and married my husband, Greg, and I even had our beautiful miracle, Maeve. But it’s this history in part that gave me a specific sensitivity to others that endure life altering attacks on their bodies. It awes and humbles me to consider what character it takes to join the military. My husband, many of his and our dear friends, and so many in our family, his aunts and his cousins who have stories that bring a lump to my throat but are theirs to share, have that stunning character that compels them to risk sacrificing so much: Their comfort, their own choices, their families, even potentially their lives. In our household, we’ve been extraordinarily fortunate. 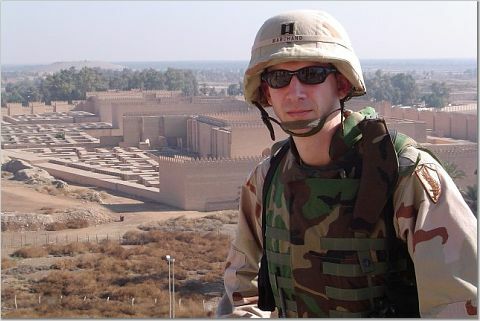 My husband was deployed to Iraq shortly after we were married, but before we had Maeve, and aside from brief trips to the Middle East, he’s been in the States since, including the past year when he was mobilized. I rarely spoke of this mobilization, because to have your husband gone for a year and still come home most weekends doesn’t even register as a point of concern in comparison to what so many military families endure, all for the sake of the greater good. Having experienced my own medical trauma that left me living daily with an altered body, I can’t fathom withstanding this agony in the presence of war and to such extremes. And anything we can do to mitigate that agony should be a necessity. While I’m admittedly composed of about 90 percent emotion and quick to cry, I embarrassingly well up every time I see any person in uniform. That camouflage has a certain charisma. It speaks to so much more than a pattern, it speaks to the character of the person wearing it. Thank you to my husband Greg, his family, our friends and every single member of the Armed Services for all you accomplish and risk every day!! *For food coloring, I recommend Americolor Soft Gel Pastes. Chocolate Brown, Leaf Green, and Forest Green (Moss may be a good choice too.) 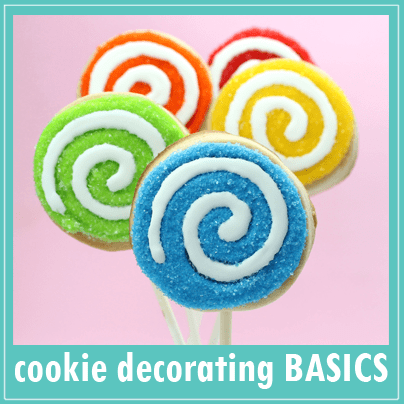 For basic cookie decorating instructions, click here. Prepare cookie dough according to the recipe, chill, roll out, cut out squares, bake and let cool. Prepare icing according to the recipe, divide and tint your colors. To prepare the army green, I mixed brown and forest green food coloring. For the bright green, I used a good amount of leaf green food coloring. For the light brown, I used just a drop or two of the brown food coloring. For the dark green, I used a good amount of forest green coloring. 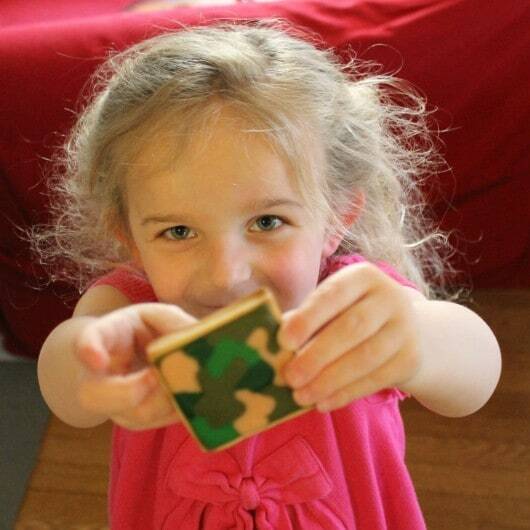 Prepare a decorating bag with coupler and tip and fill with some army green icing. 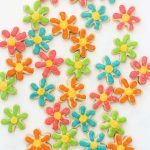 Thin the remaining colors of icing so they are closer to a flooding consistency, but are still thick enough to stay in place when piping. 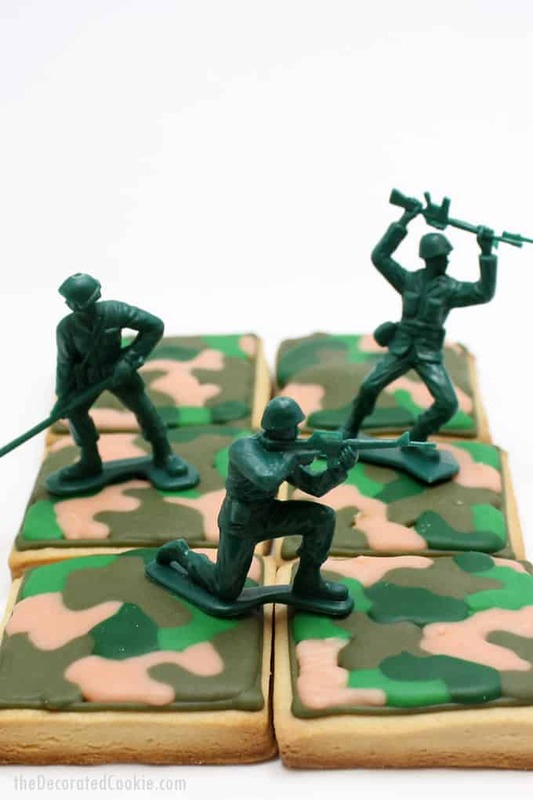 To decorate the cookies, outline the square with the army green icing. Pipe and fill the camo design with the other colors. I understand your emotions when you see a person in uniform. I work at a Veteran’s Home in California, and I see first hand what happens to some of these heroes later in life. It saddens me to realize that a lot of them end up alone with no one in their final days. I feel it is my job to make them as comfortable and happy as I can in their final home. From one military wife to another, thanks for this post. What a great post and thanks for sharing! Always a good time to pay homage to our service men and women! Thank you all! 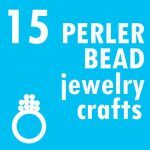 And wow, Penny, what amazing work you do! Aw, Krystine, :). My husband was in Iraq for 5 years (he’s a UN doctor) so I know all too well what it’s like to only have him home a week at a time. Bravo to you for bringing attention to the very important Wounded Warriors Project and a big thank you to your husband for his service. P.S. The cookies are great as well! Meaghan wonderful post! 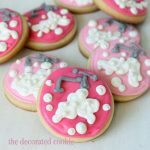 The cookies look amazing. 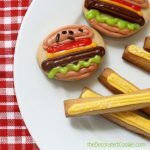 These are awesome Meaghan…love it! Very well-written post and an excellent way to bring attention to the Wounded Warrior Project. My father served in the Cdn. military as did my Mom (wartime only for her). My husband has been retired from the forces for five years now and my son is currently serving. I understand your *little secret*. I have the utmost respect for all those who choose to serve and for the families that support them in that decision. It is not a life for everyone but everyone who chooses it should be admired, respected and supported by all of us. Your cookies are great and your little Maeve is precious. 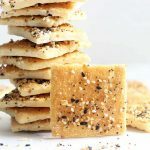 Love this post and your amazing cookies! Megs, I’ve read your article a more than once. It always helps me to put things in perspective. As for Greg, give him a hug from my family, because he sacrifices SOOOOOOOOO much for us. And then, give yourself a hug tooo, because I know from experience it’s not easy to be on the other end of that deal either. We love ya, Megs, keep the awesome coming! Moving post. Spoken from the heart. Thank you to your husband and all the military people out there, past and present. 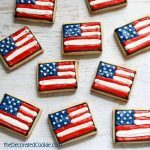 Great project to support and lovely cookies too. thank you to your hubby and others out there!….my cousin is getting deployed this month for a year with a 1 year old and baby #2 on the way. Thank you Meaghan and thank you to your whole family. It truly is an entire family that serves. An entire family that sacrifices. My love and gratitude to you! Thank you all for your support and kind words, too! Sniffle sniffle, thank you Callye! Oh, Michelle, that is exactly the kind of sacrifice I think of when I well up… parting from babies for so long, I can’t even imagine. It’s incredibly difficult. Hoping for the best for your family! This post is a great way to bring attention to the Wounded Warrior Project.Your husband, along with all the women and men in uniforms are heroes for keeping us safe.Wives and families are heroes also because they have to be away from their love ones and live in neddles hoping that they will be fine.I have a lot of respect for all those who choose to serve. 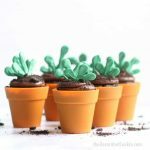 These are amazingly cute! Gonna have to make some for my hubby! 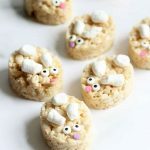 Doing these for a playdate! !